ML Bot is now "Free for non-commercial use"
Since 2007, ML Bot has been a paid bot: you could either purchase a license or pay the rental fee of 2.5%. We are happy to announce that today we make a big shift: we decided to make ML Bot "free for non commercial use". What does it mean? It means that if you use the bot on a small scale (for example to sell your leftover draft cards) you will not pay to use the bot. If your trading will be low enough and do not exceed 5 tixs in rental fees in 30 days, the fees will be zeroed automatically. This amounts, more or less, to the buying and selling of 200 tix worth of cards in a month. At the end of the month our servers will cancel the rental fees automatically and start you back from zero. You will be notified via email when this happens. The core idea is that if you are just using the bot as a little shop to resell few cards or sell your draft leftovers, you pay nothing. We give you the client, the server, and wikiprice - for free. If you are a little shop the extra 2.5% margin can give you more freedom, you can try different strategies like squeezing your margins to get more traffic or using higher margins to buy new hardware or inventory. A whole new world of possibility awaits, enjoy! There was a crash happening on some LITE bots - we have just fixed it and released the update. 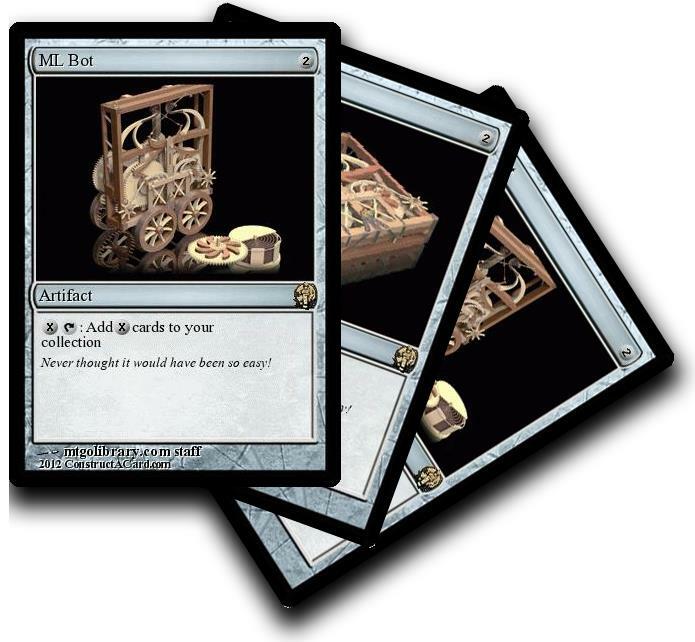 ML Bot 10.26 implements a new card removal mode in Buying mode. The current one is to type the card numbers you want to remove (for example: 1 3! 7 to remove card 1, card 3 and card 7). The new one let you type the price of the cards you want to remove. 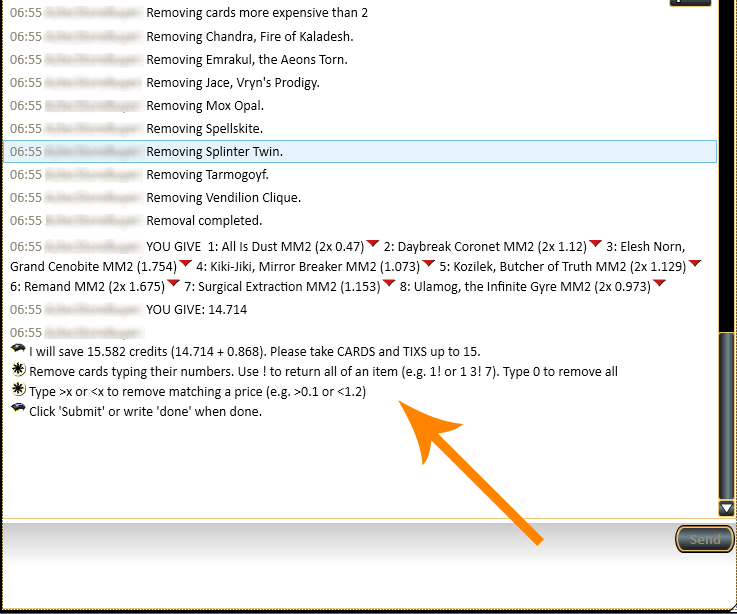 You can remove, for example, cards whose price is greater than 0.5 by typing ">0.5", or remove cards cheaper than 0.01 by typing "<0 .01"
We also slightly changed the quote messages in order to have shorter and clear chat message. ML Bot 10.25 introduces a better control on regular/foil consistency. 10.25 let you specify what the bot will do when a regular price is higher than a foil price. 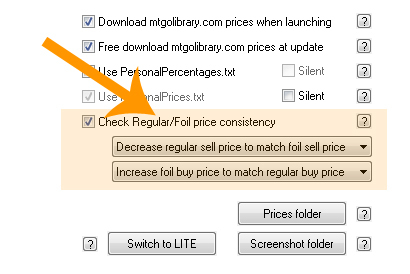 For sell prices, you can choose to increase the foil (sell) price at the level of the regular price or decrease the regular (sell) price at the level of the foil price. For buy prices you can choose to increase the foil (buy) price at the level of the regular price or decrease the regular price at the level of the buy price. We have just released ML Bot 10.23, a minor update over 10.22 fixing a crash happening on the new autotransfer mode.